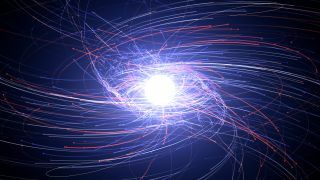 Electrons and their antimatter counterparts, positrons, interact around a neutron star in this visualization. Why is there so much more matter than antimatter in the universe we can see? Paul M. Sutter is an astrophysicist at The Ohio State University, host of Ask a Spaceman and Space Radio, and author of Your Place in the Universe. Sutter contributed this article to Space.com's Expert Voices: Op-Ed & Insights. So there's this stuff called "antimatter." You may have heard of it. It's just like normal matter, with all the same properties and all the same abilities to make up atoms and molecules, except for one crucial difference: It has an opposite charge. Take the humble electron, for example. Mass of 9.11 x 10^-31 kg. Quantum spin of 1/2. Charge of -1.6 x 10^-9 coulombs. It has an antimatter evil twin, the positron. The positron has a mass of 9.11 x 10^-31 kg. Quantum spin of 1/2. Charge of … 1.6 x 10^-9 coulombs. It's the same for every other particle out there. There's a dark-side twin for the top quark, the neutrino, the muon and on and on and on. All the fundamental particles that make up our daily lives have a partner, living just on the other side of the charge fence. That's all well and dandy and no big deal at all, except for one thing, which is a tiny bit of a big deal. As far as we can understand the theory and see in the observations, not only are matter and antimatter paired up like this, they're symmetric. Every particle of normal matter produced in a reaction comes paired with its antimatter sibling. The only conclusion: Our universe ought to be swimming with antimatter, existing in equal parts with normal matter. Whole planets, stars and galaxies made of antimatter! Or at the very least, loads of antimatter particles just floating around in space, minding their own business. But when matter and antimatter meet, it's bad news. Just as the pairs are produced in perfect symmetry in fundamental interactions, they are destroyed in symmetry as well. When a particle finally gets to meet and shake hands with its antiparticle best friend, they end up like Butch Cassidy and the Sundance Kid: going down in a blaze of glory. All their combined matter is converted into energy, usually in the form of high-energy gamma-ray radiation. We don't see signs of abundant free-floating carefree antimatter, because we don't see the aftermath of its inevitable destruction upon meeting regular matter. The universe is filled with constantly-interacting stuff. High-energy particles zipping across light-years. Fountains of material escaping from galaxies and new junk drifting in. Stars colliding. In our universe, stuff mixes with stuff all the time. If some decent proportion of that was antimatter, the universe ought to be a lot more … energetic … than it is. So if the antimatter isn't here anymore, where the heck did it go? One possibility is that our universe was simply born this way, with an abundance of matter and a severe lack of antimatter. While that's certainly an excuse, it isn't much of an explanation. "That's just the way it is, folks" isn't the most compelling argument in scientific circles. So while you could always say that, let's move on to other, more productive lines of inquiry. Perhaps something in the early universe caused an imbalance between matter and antimatter. It's not that crazy of an idea. The early, early, early days of the universe were pretty funky times, with all sorts of crazy physics and exotic interactions at play that are now, thankfully, merely a cosmic memory. So maybe something happened. Maybe the universe was rolling along just fine, with each particle met with an equal and opposite antiparticle. And then … a shift. An imbalance. A strange process that produced more matter than antimatter. Most of the pairs would be annihilated, but a few normal particles would remain. It wouldn't have to be much: Just one particle in a billion would be enough to lay the foundations for all the stars and galaxies that we see today. It would indeed have to be a very peculiar set of conditions to cause such an imbalance. Our universe is governed by rules of how particles and forces should interact and behave. It's these rules that lay the framework for all the wonderful interactions that make up the richness of everyday life. But sometimes rules need to be broken, as in the case of the early universe. After all, it's those same rules that say that the divergence between matter and antimatter ought not to be in the first place. Whatever interaction, whatever process, led to matter's ultimate victory had to be strange indeed. It had to start with producing not just an excess quantity of regular matter, but also an excess quantity of charge to counterbalance it. Otherwise, because total charges must stay the same throughout a process, that matter-loving route would've been perfectly balanced by a twin antimatter-loving road. Plus, this process had to happen during a sharp boundary, when the infant cosmos was transforming rapidly from one state to another. It's only there that the physics would permit such a rule-breaking violation to take place; otherwise a universe in equilibrium would just end up balancing all interactions out anyway. Is there anything in all of known physics that could make the antimatter go away? Well, maybe. There are some hints and suggestions buried in rare particle interactions involving the weak nuclear force. We understand these interactions only dimly, especially the way they would occur in the early universe, but even there our best guess for its matter-favoring ability put it far, far below the minimum needed to explain our present situation. Learn more by listening to the episode "Hey, who took all the antimatter?" on the Ask A Spaceman podcast, available on iTunes and on the Web at http://www.askaspaceman.com. Thanks to 185transformer, William G., Matthew A., Bogdan V., dave B., Eric D., Kent B., and Kahandran for the questions that led to this piece! Ask your own question on Twitter using #AskASpaceman or by following Paul @PaulMattSutter and facebook.com/PaulMattSutter. Follow us on Twitter @Spacedotcom and on Facebook.